Boring sounding title, since it’s essentially “soup and bread”, but bear with me! I had quarter of a white cabbage left that I had bought for salads. 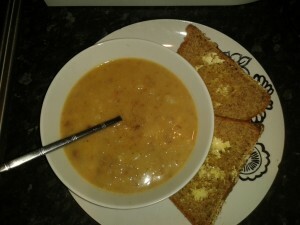 Unfortunately I get bored of salad as much as I hate wasting food so I decided to make soup. Can’t have soup without bread so since I accidentally bought far too much bread flour the last time I attempted internet grocery shopping….well, the rest is food history! This soup is creamy, flavoursome, warming and amazingly still vegan. The bread was light and tasty with the type of chewy crust you just have to tear using your gritted front teeth! Delicious with a smearing of vegan spread or a bit of vegan mayo. Heat up the oil in a large, heavy pan. Chop up the potato into chunks (skins included – that’s where the healthy good sh*t is!) and add to the oil. Pop a lid over the pan and cook the potatoes until they get to that stage where they begin to stick to the bottom of the pan. Stir and scrape the bottom of the pan with a wooden-spoon and cook for a further 5 mins. Add the onions and garlic and keep stirring / scraping until the onions go soft and translucent. Add the beans, paprika, salt and black pepper and give it all a good stir before adding the cabbage. Stir some more and add the stock. Simmer for 15mins (or until the potatoes are soft), stirring every now and then to make sure that the bottom doesn’t catch. 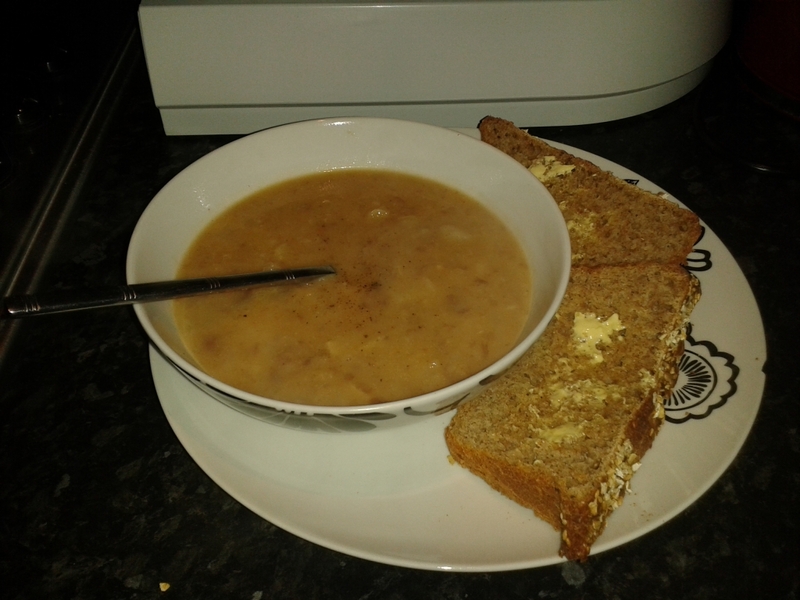 Allow to cool a bit before using a hand held whizzer to half-whizz the soup (I like to leave chunky bits so that I don’t get booored whist eating it). Reheat before serving in a bowl with a hearty side serving of…..
300 x ml warm, but not hot water (I mix kettle-boiled water with cold from the tap). Dissolve the sugar in the warm water. Sprinkle the yeast over the top and leave for 15mins until a frothy foam starts to form. In a large bowl (preferably not a metal one) add the flour and using a wooden spoon, stir in the salt. Add the vegan spread and rub into the flour to create fine breadcrumbs. Try to leave a little distance between the bowl and your hands whilst rubbing so try and make the crumbs airy. Create a well in the centre of the floury-crumb mix and add the yeasty water mix. Stir in slowly until a soft sticky dough forms. If the dough is too wet and sticky, add a little more flour. Knead either by hand or using a food mixture with a kneading attachment for 10 mins. Leave to prove for 30 mins. Then knead again for another 10 mins or until the dough is smooth and springy and elasticky. 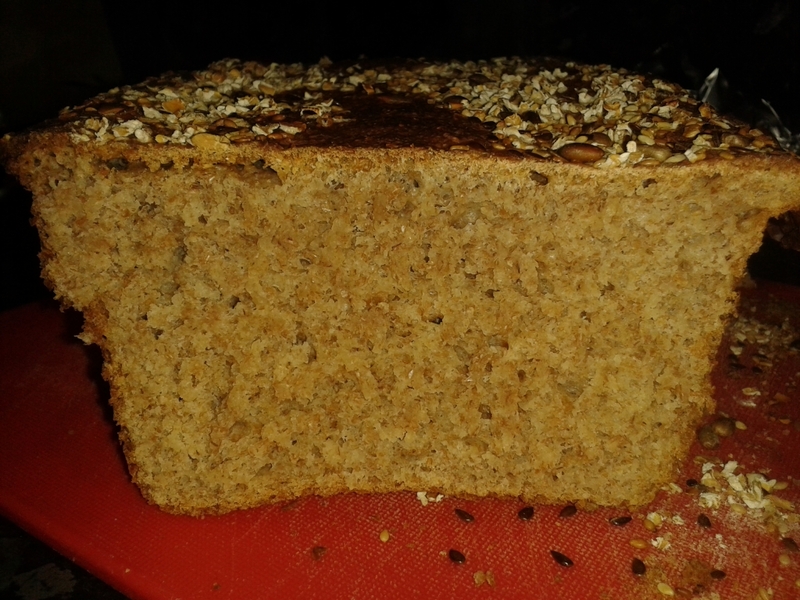 Different recipes will tell you different proving times, but next I whacked my dough into a greased, non-stick bread loaf tin, sprinkled with seeds (I pressed them in slightly to make them stick) and left in a warm place for 20 hours (i.e. tea time the next day!). The mixture had more than doubled by the time I got round to baking it, lovely! When ready to cook, stick a baking tray on the bottom of the oven and heat up to 200oC. Pop the bread into the oven and quickly (but carefully!) pour some water into the baking tray and shut the door pronto. The steam helps to produce that beautiful chewy crust, whilst the bread stays soft and light. Bake for 30mins (cover with a bit of tinfoil if the top starts to brown too quickly – I had to after around 20mins). 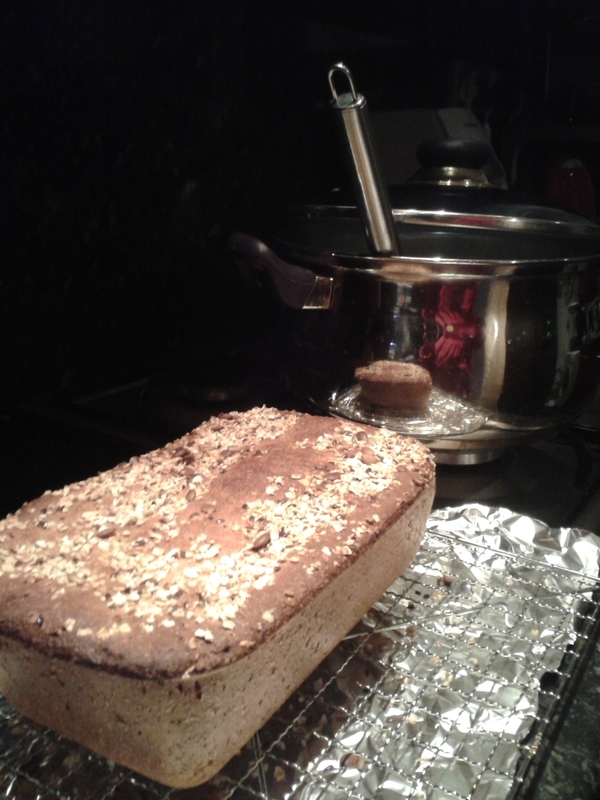 Allow to cool slightly before turning the loaf out of the tin onto a wire cooling rack. I waited until the bread was just about cool enough to touch, before hacking into thick delicious slices. Top tip – it was much easier to cut when the loaf was first turned upside down. Warm, freshly baked bread dipped into steamy-hot thick and satisfying soup. Perfect comfort food now that the weather is starting to get cooler.